A current CADS/BCAS membership is required before booking a lesson. Follow this link to BC Adaptive Snowsports to obtain your membership number. If you already have a VISAS Student Profile, use the BOOK NOW button, or click here, to continue directly to the Portal. At any time without logging in you can check under Schedule > Lesson Calendar and scroll to the month required to get an idea how busy VISAS is before making your lesson requests. You can check your Lesson Calendar from the Toolbar menu or log in to make changes, add dates or cancel lessons. Please give as much notice as you can if you have to cancel a confirmed lesson. Medical – height, weight, etc. SnowSport – Type/ *do you have your own equipment? / Select a Program – select “Daily” unless you are previously registered in one of the other program choices. (NOTE: Have A Go is only an option if you have never skied or boarded with us before). 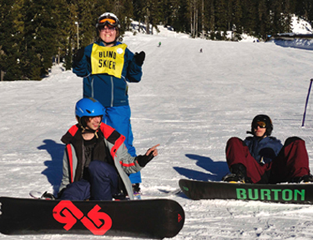 CADS# – follow the link to BC Adaptive Snowsports to obtain this number – cost is $53 per year. You can SUBMIT without this number but will be unable to book any lessons until you have entered it in this spot. Settings – Choose how you want to receive upcoming lesson reminders. SUBMIT – You will receive onscreen confirmation that you have been successful or be given directions to complete any missing information. Click on the blue document icon in the upper right corner to see a copy of the information you have entered – this can be printed if you wish. Exit this document. If you have submitted successfully, you will also receive a separate email notification. For additional instructions on how to complete your Profile information, click on the blue video camera icon near top centre of the page and a YouTube video will open. We have sit-ski weight limits. Two of our sit-skis are rated at 250 lbs (113 Kg) maximum; our others are all rated at 200 lbs (91 Kg). Alpine instructors for Ski, Sit-ski and Snowboard lessons are available 7 days a week unless the day is a Blackout day. Nordic instructors are available for lessons Tuesday thru Saturday unless the day is a Blackout day. Night Skiing – trial this season – Alpine Only – Thursday Thru Sunday, limited instructor availability, lessons will take longer to process and be confirmed.